Bone Broth Protein Powder, Bone Broth Concentrate, and Liquid Bone Broth: What’s the Difference? For some, bone broth seemed like just another health trend a few years ago when it was served out of paper coffee cups on busy New York streets. Today, it’s recognized as a source of nutrients with many benefits. As word of the benefits of bone broth spreads throughout the United States, there’s a greater demand for bone broth to be accessible, affordable, and convenient — which is why bone broth powders and concentrates have entered the health scene. Making a traditional homemade bone broth is simple, but it’s not exactly a fast process. The magic is in the slow simmer time. In order to extract all of the beneficial nutrients from the bones, such as collagen and gelatin, they must be simmered for at least 10 hours — and in some cases, up to 24 hours depending on the type of bones you use. Skip the slow simmer time, and you’ll end up with a regular stock or broth that may have a few minerals but will contain fewer proteins or other nutrients that make homemade broth special. If you’re like most of us, you have a jam-packed schedule that doesn’t always allow for several hours to make a quality bone broth. Instead of a liquid bone broth, you may have considered getting the benefits of bone broth through bone broth powders or concentrates. But can bone broth supplements really provide the same benefits as a traditional liquid broth? 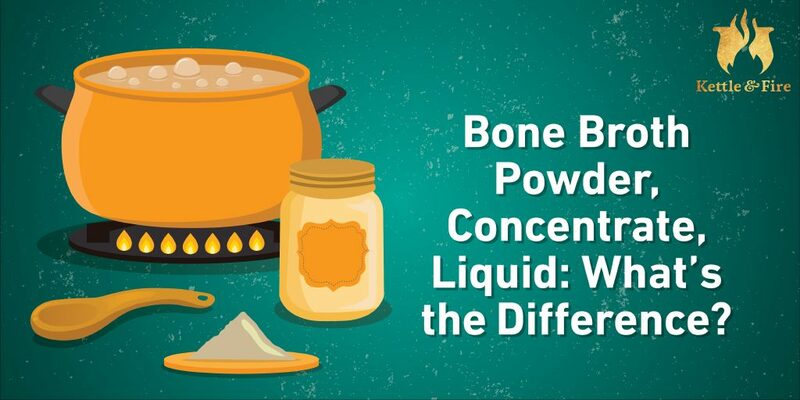 Bone Broth Powder, Concentrate, and Liquid: What’s the Difference? A bone broth powder, or a bone broth protein powder, is bone broth that’s been dehydrated at a low temperature and then turned into a powder. Bone broth protein powder is meant to be mixed with juice, water, coconut milk, or blended with your shake, while regular bone broth powder can be rehydrated and warmed up as “instant” bone broth (but you could technically add this powder to a protein shake, smoothie, or other recipes too). Bone broth powder on its own has a bland taste, so some brands add things like turmeric, chocolate, or vanilla flavor to their broth protein powders, as well as extra nutrients, like powdered greens. At first glance, bone broth that’s been dehydrated and sold as a powder may seem genius. There’s no trip to the butcher involved. You have it on hand, already made, for whenever you feel like you could use the extra nutrients. This easy-to-mix form allows you to pour, stir, and sip. Bone broth powder also tends to be less expensive per serving than pre-made liquid bone broth. A powder weighs less, which lends itself to reduced or free shipping and can save you money. Questionable processing methods. Some processing methods used to make powdered dietary supplements involve extremely high temperatures, which can denature the protein source and other delicate nutrients. May contain carcinogenic chemicals, additives, and preservatives. These are added to powdered food products to keep the proper consistency (i.e. to prevent a powder from hardening and clumping), as antimicrobials against harmful bacteria, and to extend shelf life. You don’t really know what you’re getting (lack of quality control). Now, every brand is different, and not all powdered food products will use harmful additives and preservatives. However, if you purchase broth on Amazon or another source, it could potentially contain traces of parabens, insect repellents, carcinogenic chemicals, or GMO ingredients, so it’s vital to check the ingredients. As mentioned, the natural flavor of bone broth powder isn’t the most palatable, so other flavorings, such as vanilla or cinnamon, are often added. Additionally, some supplements may also add artificial ingredients to the powders to give them a darker brown hue and make them appear fresher and more natural. Bone broth protein powders are so new to the dietary supplement market that there isn’t a ton of research on them. The little information we do have on them is vague in terms of processing methods and how well these bone broth supplements are absorbed. For example, most bone broth powders or bone broth protein powders list “bone broth protein concentrate” as the main ingredient, but not the ingredients that went into the broth itself. This doesn’t really give you any information on the nutrients you’re getting. In fact, there’s a lot of nutritional information you don’t know, like if the bone broth was made from bones or a regular broth. You also don’t know if it was made using grass-fed beef bones or organic chicken bones, which are free from hormones and antibiotics. You can’t be sure the product is gluten-free or grain-free. When animals are fed grains, they can contract diseases that then have to be treated with antibiotics (3). Since the broth has been dehydrated and turned into a powder, you also don’t get to see the marker of a high-quality bone broth when it’s made: the layer of gelatin that forms on top of the broth once the bones have been simmered for several hours. Without it, you really don’t know the quality of the broth you’re getting. Powdered broth is a processed food. This alternative is less nutritious than true bone broth in its whole, unprocessed form. Sometimes referred to as “living” beef gelatin or bone broth, a bone broth concentrate is as close as you can get to the real thing. It’s basically homemade bone broth that’s been blended into a paste, and it is similar to using a bouillon cube. All you have to do is add boiling water to a few tablespoons of your beef or chicken bone broth protein concentrate, and you have instant bone broth that you can add to your favorite recipes or drink straight up. The flavor will vary between brands, but bone broth concentrate should taste similar to a traditional bone broth. All you have to do is boil water and add it to your concentrate, which is ideal for busy lifestyles and taking your bone broth on the go. May have a higher sodium content. If low sodium intake is a regular part of your diet, bone broth concentrate may have more sodium than your average bone broth, as salt is often used as a preservative for broth and stock concentrates. Lack of quality control. Similar to bone broth powders, bone broth concentrates are fairly new to the supplement and functional foods scene. While the process of making a bone broth concentrate seems straightforward, the information online about the methods of making bone broth concentrate and the exact ingredients used can be vague. There are bone broth concentrates available, at least, that claim to be made from grass-fed bones. This information is not regulated by the U.S. Food and Drug Administration. Additives. Some bone broth concentrates contain additives, like natural flavors and yeast extracts. Bone broth liquid is traditional bone broth that’s ready to drink. Liquid bone broth is the product of bones and connective tissue that have been simmered in water with herbs, vegetables, and spices for up to 24 hours. The long simmer time allows collagen type II to be released from the bones. An acid, such as apple cider vinegar, is also used to help extract minerals from the bones. The ways to use liquid bone broth are endless, from sipping it to using it in your savory recipes. You can even add liquid bone broth to smoothies (it blends well with berries and greens) and use it in place of water for a subtle flavor and nutrient boost in your cooking. Bone broth is typically a little more bland and less salty than a regular soup stock. Soup stock is a thin liquid, while bone broth has an oily texture and feels thicker in the mouth. Complete control over quality and nutritional value. You can only be as healthy as the nutrients you absorb. When made correctly, a traditional homemade bone broth will contain nutrients that are easier for your body to absorb, thanks to the long, slow simmer time. When you make your own bone broth at home, you have complete control over the ingredients. You can source bones and connective tissue that yield a higher concentration of collagen, such as knuckles or patellas, and choose bones that have been raised organically or grass-fed to ensure no hormones or antibiotics end up in your broth. You also control the simmer time (the longer you simmer, the more nutritious your broth will be). Of course, a homemade bone broth won’t contain any additives, preservatives, or artificial colors or flavors. Best of all, you can add whichever veggies, herbs, and aromatic spices you’d like — not only to boost the flavor but also to increase the nutritional value. Although you have less control over the ingredients if you buy a premade bone broth from your local health food store, you can see what ingredients went into the broth on the food label, and if grass-fed or organic bones and acids were used. You can also see the indicator of a high-quality bone broth when it’s in its pure, liquid form: a thick, gelatinous layer that forms on top of the broth once the bones have been simmered for several hours. This is gelatin (the cooked form of collagen), which is where anti-inflammatory amino acids, such as glycine and proline, are found (6). Long cook time to extract the nutrients from the bones. Sourcing ingredients. It may be difficult to source grass-fed or organic bones, depending on where you live. Buying a high-quality, pre-made bone broth cancels out these two factors, and makes it a quick and convenient option to reap all the rewards of adding bone broth to your diet. As you can see, you can get more benefits of bone broth by cooking with or drinking bone broth in its natural form: as a liquid. If you were to choose a bone broth supplement, the next best choice would be one that’s made from grass-fed beef or organic chicken bones, has been slow simmered, contains no additives and preservatives, and has undergone minimal processing (no extreme temperatures). Without a doubt, as bone broth supplements become increasingly popular, we’ll also get more information on processing methods, quality, and whether or not they’re worth your money.